The first thing that you have to do is to envision the finished product. What kind of color do you want it to be? Do you think that dark wood is better than light? Do you want it to look vintage or semi modern? Bombard yourself with questions in order to squeeze the best ideas out of your system and always remember that sheds not only serve as storage areas of the house. Most of the time, they can accentuate the aesthetic value of a property. As a matter of fact, some realtors say that the value of a house or any property is significantly increased when there are things that highlight its beauty. This includes gardens, patios, and of course, sheds. After having a clear idea in mind, the next step is to look for shed plans. You might want to visit your local home improvement supplier to be able to check the list of plans that they provide. While some charge a minimal fee for the blueprint, you will be surprised to know that some of these plans are actually free of charge. Most of the time, the local supplier can even help you identify the materials that usually come with a particular plan. This is important, especially in choosing the right type of wood, as some might be more durable and resistant to pests, which in the end will make its lifespan longer. In addition, you must be able to discuss the price range, and if possible, cheaper alternatives in order to achieve the same effect that you wanted at a lower price. Another possible strategy is to draw the sketch of the plan on your own and ask the help of a local draftsman in order to make it more systematic, precisely measured and professionally designed. 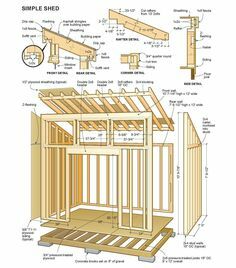 Lastly, you can use the web in looking more modern wooden shed designs. A lot of people, especially amateur designers and wood shed enthusiasts, have already made it their lives' mission to share their designs to the most number of people possible.